Silent as the hunter’s moon I chase. Golden eyes and burning breath I take. I tore their shields, I bloodied some! Bury me upon a mountain high. Danny Vaughn, who is a briliant singer and songwriter, and an all-round top bloke, wrote the above about the plight of tigers in captivity. Check out his work, and also the sentiment behind this. Wild animals, especially those that are so magnificent, have no place being kept for our amusement. As for people who hunt them for so-called "fun" or "medicine", well, I have my own opinions of how they should be dealt with, shall we say. Despite being written about tigers, this spoke to me about how a dragon might think. Not just some mindless animal, driven by instinct alone, but a powerful entity, clever and wise, with a sublime knowledge of its place in the world. Men might catch a dragon, or even kill a dragon, but no man could ever truly tame a dragon. If I have mysterious inhuman women, wizards and half-giants (soon!) in my wargame world, then dragons fit perfectly. "My armour is like tenfold shields, my teeth are swords..." Left side. 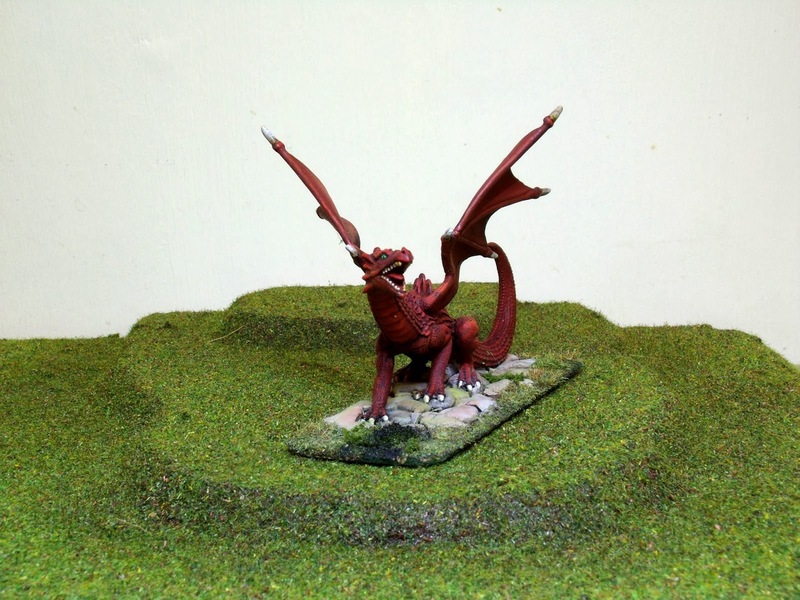 This was a Grenadier Miniatures Blue Dragon, bought probably twenty years ago and waiting for an excuse to rise again ever since. "My claws spears, the shock of my tail is a thunderbolt..." Right side. I gave it a coat of black primer (to kill the original blue) then a coat of red oxide as an undercoat. Over this went a wash of black ink, then vast numbers of drybrushed coats of different shades of red-brown, red and orange. "My wings a hurricane, and my breath death!" You do not want to get on this side! Individual scales were picked out with bright reds and oranges, and teeth, claws and eyes painted. Do you wonder everyone except Wiglaf decided to not help Beowulf fight the dragon? Three heroes plus Merlin? My money's on the dragon! 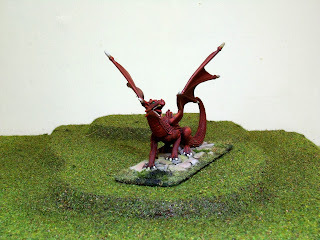 The stones around the base are polymer clay, painted, ink washed and drybrushed, with a scorch mark drybrushed into the grass. Just to remind people there aren't just teeth in that end! Reminds me of Ivor the Engine for some reason?? 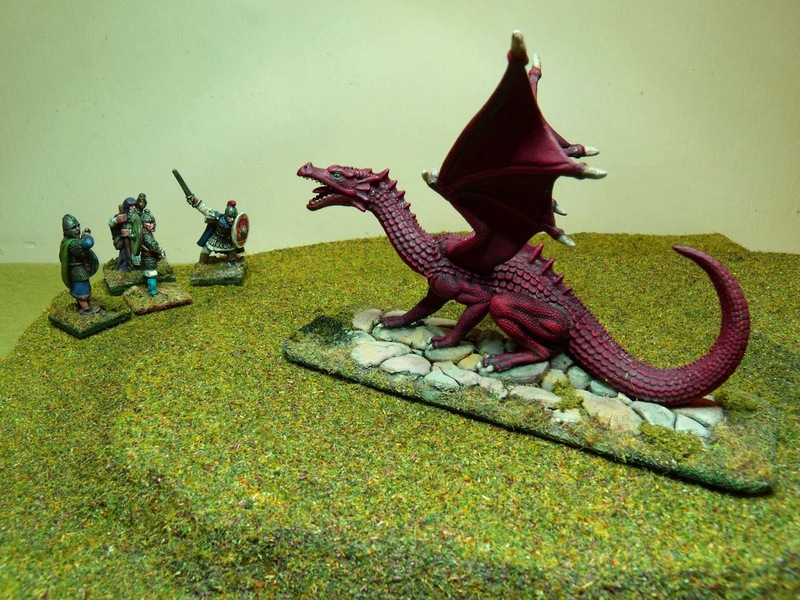 lovely colour - i have a grenadier green dragon, stashed away somewhere -badly painted and in pieces. I'll have to dig it out and see if it can be resurrected. 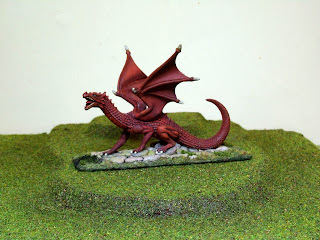 Nice dragon - the Grenadier ones have a character and quality that's rarely been matched since. Although, sorry to get political, but I'd be surprised if there's any reputable zoo that keeps tigers simply for 'amusement'. It's all very well wringing hands about tyger tyger burning bright, but not when there's so little and less of the jungles of the night, with more poachers pouring into them. Not as much time and space to wax poetic and sentimental about the subject. As for said poachers (Can't imagine so many sports hunters these days, either! Do you keep up with conservation news?) I'd be inclined to believe you; but I'd sooner reserve the punishment for the misguided, over-rich partakers of the tiger-gonad cure-all, than the desperate poor they pay to do the dirty work. Vyrmis, I'm peripherally involved in conservation work, investigating wildlife poisoning issues. It's a small part of my time but (IMO) carries weight out of proportion with the hours. I wasn't talking about zoos as such. I'm aware of how zoos operate (in the UK at least) and that many do some extremely good research and conservation work. I'm in two minds about zoos in spite of that, especially where large, highly intelligent species are concerned - it simply isn't possible to enrich the enviroment sufficiently, in my view. My real venom is reserved for circuses, the Vegas-style animal shows and so-called "traditional medicine". I'd let them get their tiger gonads: they'd just have to go naked and empty-handed into the cage and take them off the tiger. An iconic model given a first-class treatment! 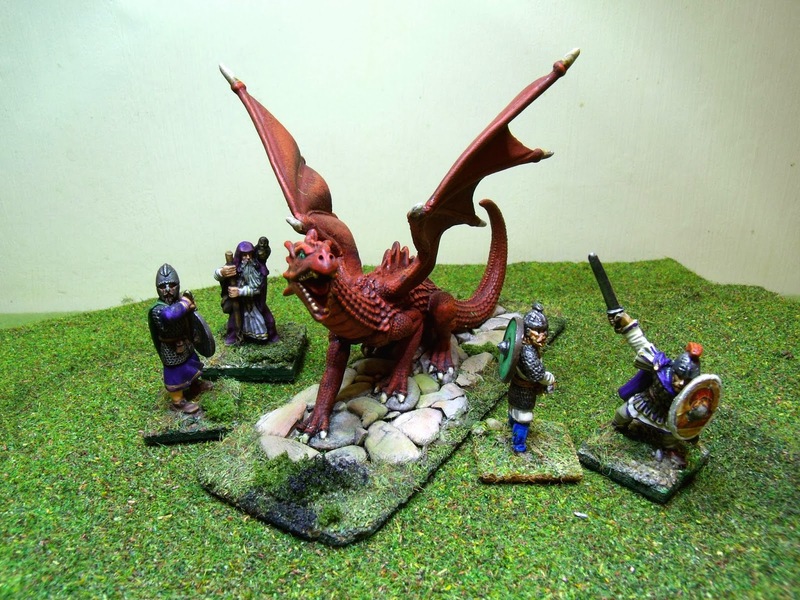 So you are planning on taking your Arthurian games into a fantastical/mythological setting? Will you use DuxB as the rules for such games, or will you look at something else (like 'Song of Arthur and Merlin', for instance)? 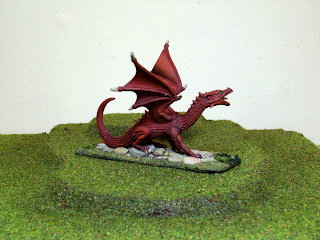 Beautiful dragon! You're right, the old Grenadier models really captured these mythological creatures perfectly. Still, it's the great painting that really brings them to 'life'. The Blue one you did was one of the very best and now you've convinced me to introduce a dragon in my DuxB games. Probably going to end up with the Silver one which is my all time favourite.